Lemon Grass - Thai Restaurant - Canberra uses their own specialised couriers to deliver their food. Wok fried lamb with fresh chilli, green pepper corn, basil leaves and vegetables. Seafood stir fry of crab, mussels, prawns, squid and egg in yellow curry. Thai spring rolls served with sweet chilli plum sauce (minced pork filling). Thai style steamed pork dim sims. Famous spicy Thai fish cakes. Spicy patties of minced pork, onion, mint and shallots. Deep fried pastry filled with minced chicken, coconut, corn and water chestnuts. Deep fried battered king prawns with almond flakes. Delicious mince chicken and potato curry puffs. A delicious mix of 1 x Fish Cake, 1 x Spring Roll, 1 x Curry Puff and 1 x Deep Fried King Prawn. Deep fried battered mixed vegetables. Char grilled boneless lean pork marinated in lemon grass sauce served with a mixture of shredded carrots and spicy vegetable salad. Spicy king prawns with lemon grass, herbs, cucumber, tomato and fresh salad. Spicy wok fried beef, with lemon grass, carrot, pumpkin with chilli tamarind sauce. Roast duck in red curry with lychees and tomatoes. Traditional Thai green curry seafood with fish, mussels, prawns, squid, scallops and coconut milk. Roast duck with spicy tamarind sauce, red onions and basil leaves. Prawns in soured lime sauce, garlic and fresh chilli served mixed with fresh salad. Grilled firm bean curd with bean sprouts, salad, crushed peanuts with plum chilli sauce. Green curry with vegetables and bean curd. Red curry with vegetables and bean curd. Creamy red curry with bean curd, crushed peanuts and kaffir leaves. Steamed mixed vegetables with peanut sauce. Wok fried bean curd with fresh chilli, vegetables and basil leaves. Wok fried bean curd with ginger, onion, dried and fresh mushrooms. Wok fried bean curd with chilli jam, cashew nuts, corn, snow peas and carrots. The famous Thai green curry (chicken or beef) with coconut milk, bamboo and eggplant. Red curry (chicken or beef) with coconut milk , bamboo and eggplant. A mild yellow chicken curry with coconut milk, potato, tomato, pineapple and onion. The famous Thai curry (chicken or beef or prawn) with coconut milk, potato and roasted peanuts. Hot and spicy red curry (chicken or beef) with vegetables and herbs (without coconut milk). Red curry (chicken or beef) with pumpkin and coconut milk. 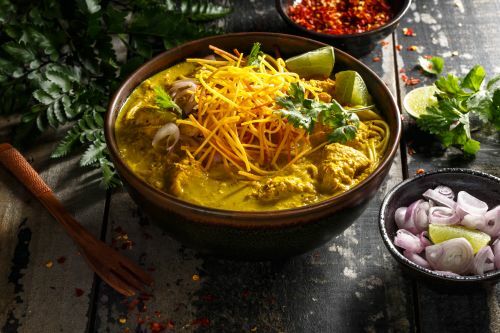 Creamy red curry (chicken or beef) with crushed peanuts and kaffir leaves topped with crispy egg noodles. Creamy red prawn curry with crushed peanuts, kaffir leaves topped with crispy egg noodles. King prawns with garlic and pepper, served with steamed carrot and broccoli. Sweetened king prawns with orange herb sauce served with carrot and pumpkin. Stir fried king prawns with ginger, onion, dried and fresh mushrooms. Wok fried spicy king prawns with fresh chilli, corn, green beans, basil leaves and fresh mushrooms. Wok fried king prawns with snow peas, young corn, bean sprouts and fresh mushrooms. Wok fried sweet and sour king prawns with corn, pineapple, cucumber and tomato. A mild yellow prawn curry with coconut milk, potato, pineapple and tomato. Choice of steamed whole fish or fillet with spicy chilli and lime sauce. Choice of deep fried whole fish or fillet with spicy tamarind sauce, onion and basil leaves. Wok fried (chicken or beef) with fresh chilli, corn, green beans, basil leaves and fresh mushrooms. Wok fried (chicken or beef) with chilli jam, cashew nuts and corn. Wok fried (chicken or beef) with ginger, onion, dried and fresh mushrooms. Wok fried sweet and sour Thai style (chicken or beef) with corn, tomato, cucumber and pineapple. Wok fried (chicken or beef) with snow peas, young corn, bean sprouts and fresh mushrooms. Chicken breast with steamed vegetables in peanut sauce. Wok fried (chicken or beef) with garlic, pepper, carrot and broccoli. Wok fried (chicken or beef) with carrot and pumpkin in sweet orange and herb sauce. Thai stir fried rice noodles (chicken or beef or prawn) with crushed peanut, egg, chilli jam and bean sprouts. Stir fried noodles in sweet soy sauce (chicken or beef or prawn) with egg, carrot and Chinese broccoli. Steamed rice with coconut milk. Fried rice with (beef or chicken or prawn) and vegetables. A spicy blend of ground rice, chilli, fresh Thai herbs and salad with minced (chicken or beef). Char grilled beef, thinly sliced flavoured with ground rice, fresh Thai herbs and tamarind sauce. Favourite Thai spicy chargrilled beef salad. Hot and sour fresh mushroom soup with fresh Thai herbs. Spicy fresh mushrooms with coconut soup and fresh Thai herbs. Famous Thai hot and sour prawn soup with fresh herbs and fresh mushrooms. Classic Thai spicy chicken in coconut milk soup with fresh Thai herbs and fresh mushrooms.